Monday to Thursday: 9:00 a.m. to 8:30 p.m. 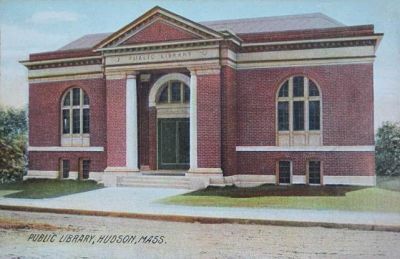 The Hudson Public Library has served the residents of Hudson and the surrounding area since 1867. By 1903 the library had outgrown its location in the town hall and needed a larger space. In response to this growing need, Grace Wittemore, the librarian, corresponded with Andrew Carnegie and requested funds for a new building. Mr. Carnegie donated $12,500 to the town to build a new library building. The current building at Wood Square was opened to the public in November, 1905. In 1929 a second floor was added to the building. This space is the current reading room, housing magazines and newspapers, the Tavares Meeting Room, and the library’s tech service offices. A two-story addition was added in 1966, coinciding with the town’s centennial. This addition allowed for expansion of public services in all areas: adult on the main level, and children’s and meeting space on the ground level. We have since made many changes to include public computers, work spaces, a welcoming children’s department and teen space. Thus from one simple room the Hudson Public Library has evolved into an imposing structure facing Wood Square. Sixty five thousand volumes are now available, together with widely diversified modern services. In our historic Carnegie building, we strive to provide the customer-friendly service that is a hallmark of an earlier time as well as the professional guidance needed for today’s technology and information needs.